With Xeriscape as a rising trend in Texas landscapes, we have maximized our inventory of cacti and succulents in our store. If you are looking for low maintenance plants that require little to no water, the following varieties are a great option. Come by and check out the new and exotic agaves we have in stock! Water conservation has become a high priority topic in central Texas. People are starting to become more self aware of their water consumption, and in many central Texas cities, water conservation guidelines are being implemented. As noted in one of TAMU's articles on Xeriscape, the Texas Agricultural Extension Service is educating Texans in Xeriscape landscaping, in an attempt to reduce excessive water use. This trend consists of quality landscaping that conserves water and protects the environment. Traditional landscapes may incorporate one or two principles of water conservation, but they do not utilize the entire concept to reduce landscape water use effectively. 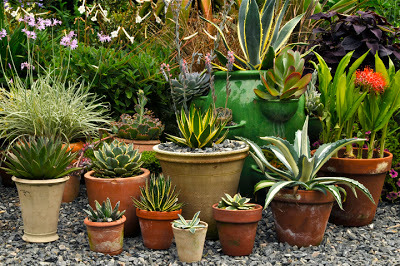 Although xeriscapes do not necessarily have to consist solely on cacti and rocks, many of these do incorporate these type of plants. 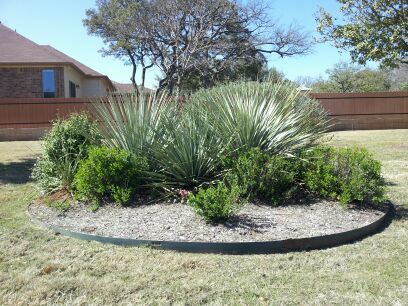 Your Xeriscape can be full of color and drought tolerant natives that that work together in this type of environement. By incorporating these seven principles, you can help preserve our most precious natural resource-water.